Visual Algos provides analyzed, integrated easy-to-read charts for the financial markets. As many as 140 algorithms per security are generated by Visual Algos System and subsequently an optimal algorithm is selected to be customized and visualized for the client-specified security. Visual Algos' approach to technical analysis is based on the principle that a single algorithm is not applicable to all securities and for every security there is a corresponding algorithm to be identified and visualized. 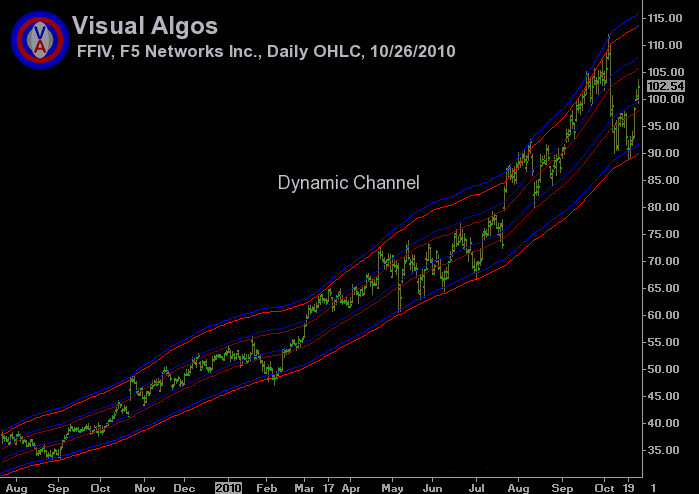 Visual Algos' technical research complements fundamental and behavioral analyses by visually enhancing trends, cycles, and patterns. Visual Algos System is an integrated multi-faceted analytical system. It was originally developed in 1999 as a visual aid to trace financial markets' trends and has since evolved into a dynamic analytical platform capable of integrating robust technical algorithms into a multitude of readily visualized charts. Dynamic channel is a channel of varying width.